A deadly disease is plaguing your legal practice. It’s called “Excusitis”. 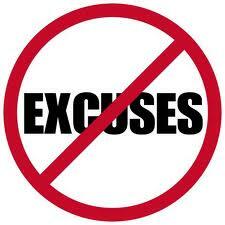 Excusitis occurs when you come up with the various reasons why you cannot do something. Here’s the rub – no matter what excuse you may have, someone has already debunked it. For example, the “I’m too old to ___________ (insert activity here)” excuse. Age is truly just a number. Colonel Harlan Sanders began to franchise Kentucky Fried Chicken at the age of 65, Anna Mary Robertson Moses, better known as Grandma Moses began her prolific painting career at 78. George H.W. Bush went skydiving at the age of 80, 85 and 90 years of age. So what are the top 5 excuses for not becoming a Rainmaker? I have debunked this myth a number of times in my blog. The most important idea to grasp is to stop thinking of Rainmaking as individual activities which take up time but as a way of thinking about all interactions you have with others. Remember, rainmaking is about creating relationships with others that turn in to business or referrals. I need to focus on my billable hours. If you don’t have clients, you will not have billable hours. My firm gives me client matters to work on. Great! This was the excuse that over 10,000 associate and mid-level attorneys in 2008 and 2009 gave during the great legal recession. The attorneys who weren’t laid off were those who were bringing in business. Again, if there are no clients, you will have no work. It’s time you started being proactive about your career and developing you own book of business. I’m a lawyer – I didn’t go to law school to become a salesperson. See # 2 and #3. Learn! There are books, seminars, courses, classes, blog posts, and coaching resources out there. The only cure for excusitis is to take action. Stop using excuses to explain why you aren’t doing the tasks necessary to become a Rainmaker. If you are an attorney and want to try an individual coaching session – give me a call.